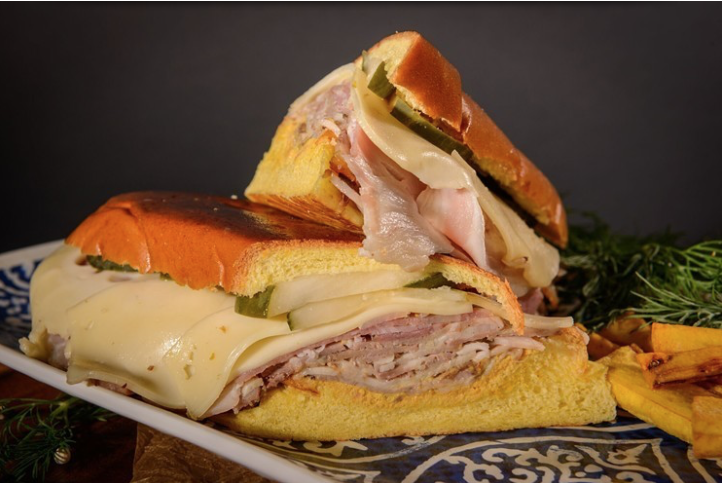 Sanguich de Miami, a wildly popular Cuban sandwich shop, has returned to Little Havana — this time, for good. Last month, Sanguich's co-owners, Daniel Figueredo and Rosa Romero, quietly opened a permanent storefront three blocks west of the spot where their original shipping container debuted last year. This Saturday, September 22, they'll host a grand-opening celebration. "We fought so hard for this moment, and now we're celebrating," Figueredo says. "We always planned to open a brick-and-mortar. After everything, it worked out for the best because it made us expedite our original plan a little faster." The menu remains exactly the same, offering a lineup of sanguiches(sandwiches) and batidos (milkshakes). Highlights include medianoches, pan con bistec, croqueta preparadas, and cream cheese-filled Elena Ruzes, paired with a rotating selection of shakes, including guava and cream cheese. There are also plantain fries served with up to five variations of mojo sauce, as well as Cuban nachos. Items cost $6 to $10. All ingredients, from ham and pork to mustard and pickles, are prepped and cooked in-house. Bread is the only item not made onsite. Figueredo and Romero created their own recipe, which is made in a bakery in Homestead. "With the brick-and-mortar, we're inviting people into our home," Romero says. "It's a new experience for us as restaurateurs and for our customers." The fast-casual concept allows patrons to place an order, take a seat, and wait for their food to be delivered to their table. In addition to providing indoor seating, the space also offers a ventanita, or walk-up window, for customers on the go. "We're staying true to our brand," Figueredo says. "Now we just have more real estate to do it." In October 2017, Figueredo and Romero converted a shipping container into a Cuban-sandwich shop and opened it right on Calle Ocho just a few blocks west of Ball & Chain and Ella's Oyster Bar. For about two months, the small space with a walk-up window churned out a bounty of gourmet Cuban sandwiches. It even earned a nod from New Times as one of the best openings of 2017. Without notice, Figueredo and Romero closed the shop this past January. At the time, Sanguich's public relations representative, Liza Santana, told New Times that "there are no laws in place that handle their business medium [as a shipping container]. They did everything they were required to do, but unfortunately, not all of Miami's governing organizations were on the same page." Sometime in the future, Figueredo and Romero plan to revive the shipping container. Sanguich de Miami. 2057 SW Eighth St., Miami; sanguichdemiami.com. Monday through Thursday 10 a.m. to 10 p.m., Friday and Saturday 10 a.m. to midnight, Sunday 11 a.m. to 8 p.m. Grand opening 6 p.m. Saturday, September 22. Admission is free; RSVP via eventbrite.com.